The buffet is arguably the best thing ever to happen to Tennessee cuisine. This gives everyone in your group a chance to fill up on their favorites for a single price, and by all means, you should take advantage of it. From Chinese and sushi to good old southern eats and more, you can eat ‘til your heart’s content at these 10 best buffets in Tennessee. This old country whistle stop has one of the greatest hidden gems in Tennessee cuisine. With homemade southern dishes like fried chicken and seafood, you can eat your fill and never worry about walking away hungry. It's just like having Sunday dinner at Grandma's seven days a week. This Nashville tradition has been serving up some of the most amazing southern eats since 1975. Their hot buffet and fresh salad bar are served every day of the week, with rotating selections that are always sure to please. Drinks, bread, and desserts are included with every meal, so don't be shy. Their Italian buffet is simply divine. You can eat your fill of a variety of pizzas, pasta, stromboli, and more. It's all you can eat for under ten bucks, and you can get it to go, too! It's by far the easiest and most cost-effective way to sample some of the best items on their extensive menu. The breakfast buffet here is a clear winner! All you can eat for just $9, their buffet is chock full of classic breakfast items, fresh fruit, a pancake bar, and eggs made to order. It’s one of the best values in town by far. Don’t judge a book by its cover—the fans of this place swear it’s not a place you should pass by without trying. Their buffet is simple, featuring salads, desserts, and a rotating selection of seafood, chicken, and other southern dishes. There’s enough selection to get a good meal, but not overwhelming to the point you don’t know what to try first! If you’re looking for variety, you’ll find plenty here. This sprawling Chinese buffet has over a hundred items to choose from, including soups, sushi, seafood, chicken, and desserts. It’s all you can eat for well under $10. The atmosphere here is just as amazing as the food. They’re dishing out an authentic look and feel throughout the restaurant, alongside a top-notch Mexican buffet for a quick and satisfying lunch. This all-you-can-eat lunch buffet gives you some of the best Greek cuisine and a drink for just $9. Authentic Greek cuisine lines their buffet Monday through Saturday, all homemade from scratch for fresh quality. 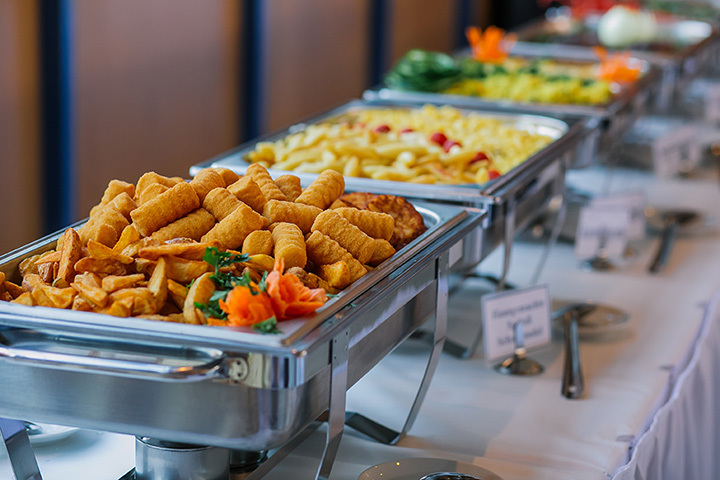 This family-friendly buffet treats everyone like a regular, and you’ll like part of the family. They rotate through a variety of southern eats, including barbecue, chicken and dumplings, fried chicken, roast beef, and meatloaf, among others. They’re also known for their weekend buffet extravaganzas with tons of steak and seafood ready for the taking. If you love Indian cuisine or have always wanted to try it but never knew what to order, this place was made for you! Their buffet offers a little bit o’ everything so you can sample away and find your favorite new dishes. They also have tons of vegetarian-friendly options so everyone can find something they love.